With Halloween approaching and ghosts popping up everywhere, I was actually prepared for this question, asked — as usual — in the car, en route to preschool. Niko, nearly five now, is a thinker, a ponderer, and a worrier, and these quiet twenty-minute excursions are fertile ground for some deep questioning sessions. 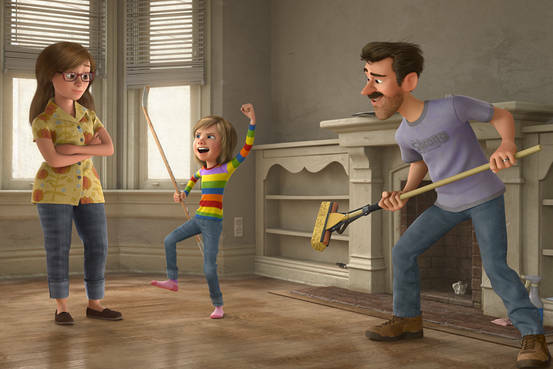 We watched Inside Out last summer, and the concepts in the story have been really useful as we dissect and examine all those complex and intertwined emotions that some kids Niko’s age experience. (If you haven’t seen it, it’s a wonderful movie about emotions. I mean, literally starring the emotions: Joy, Sadness, Anger, Fear, and Disgust. I highly recommend it, though Niko’s age — 4 years old when we watched it — is borderline for being ready to handle the range of feelings and experiences the story covers.) But also in the story was Riley’s observation that her new home, empty and lonely, looked like a haunted house. Niko had mentioned this once not long ago, and I’d deflected the question in a truly skilled manner, but I knew I’d have to face a barrage of questions sooner or later. In preparation for the coming onslaught of inquiry, I did some thinking, pondering, and, yes, worrying of my own. Riley and her parents dispel the blues in their empty house with a rousing game of hockey. So when the inevitable question arrived, I had a triage of answers ready, and I began with the simplest. “A haunted house isn’t real, but in stories, it’s a house where ghosts live.” There. Simple. “What’s a ghost?” Of course. He was going for the long route. I could tell this was not going to be a short conversation. He’s known about ghosts for awhile, naturally, but it’s recently occurred to him there must be more to them than a silly white sheet with a cheerful grin; otherwise why would people be afraid of them? By this time (oh thank you God) we were pulling into the parking lot and entering our flurry of unbuckling, collecting lunch box for snack, collecting little sister, putting that special toy back into the car, looking both directions to cross the parking lot… and the questions were cut short. Really, I thought, I’d acquitted myself quite well. My answers were clear, concise, and to the point, each giving the information requested and no more, never overwhelming with too much. That was one paranormal/metaphysical/ theological discussion of which I could be proud. Right? Right? Fast-forward to this morning. Aaron was working on the chicken coop; I was puttering in the garden shed, tidying away dried lavender and sweeping shelves and floors and organizing tools and doing all those odds and ends one needs to do if one wishes to actually use one’s gardening shed for gardening. Niko was running the length of the yard, now visiting Dad, now Mom, in his peregrinations. As I organized, I caught sight of a collection of pinwheels we’d used to deter birds from eating our berry harvest, and realized I was missing one of the sturdy metal ones. I sent Niko running for it. I’m telling you, teaching theology to a preschooler is hard. 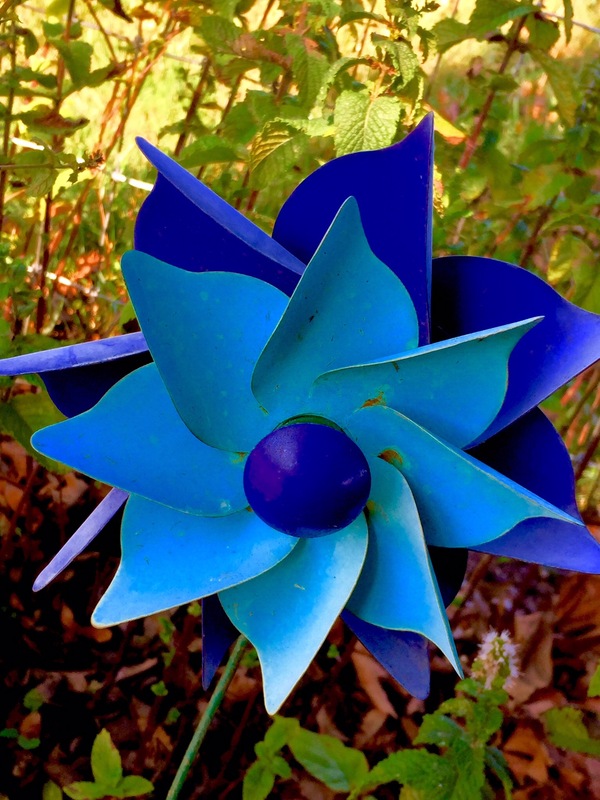 A blue pinwheel: possessing a spirit that can commune with God? Photo copyright Pixar Animation Studios, found by me via a blog post called “Mental Wellness in Movies: Inside Out,” from Projected Realities. What a wonderful post! And what a beautiful insight into the precious mind of a child! God bless you for writing this, and thank you so much for mentioning my review of such a wonderful movie! I pray for blessings for you and your family. =) Take care!